Ho Chi Minh City University of Technology – Vietnam National University, HCMC has reached its history of 50 years. The University was formerly known as National Technical Center which was established on 29 June 1957 to undertake the mission of “…training young people in engineering fields contributing to the economic and technological development of the country”. However, the long-standing tradition of member colleges under National Technical Center can be traced back to the early 20th century. Up to the earlier 1970s, National Technical Center had 5 colleges, each of which carried its special training features with the enrollment of 3,000 engineers and graduated technicians. College of Civil Engineering was founded in 1911 and became a member of Dong Duong College in 1917. From 1919, the Ccollege had produced specialists, technical staff and engineers in civil engineering. On 9 March 1945, Japan seized power in the military coup against France and the college was closed. During the resistance war against France, for the security reason, France moved the College to Sai Gon (the former name of Ho Chi Minh City). From 1950, the College had trained engineers in Indochina and was responsible for organizing admission examinations to engineer level in the colonies (Cambodia, Laos). The first training system recruited students from pre-university classes who were also equipped with necessary technical knowledge, students possessing high-school degree granted by French Government or co- granted by French - Vietnamese Government, or those holding Bachelor Degree in General Mathematics or Physics. The classes at College of Civil Engineering were instructed by professors from Departments of Education, Civil, Economics, Medicine, and Geology. The College was included as a member of National Technical Center in 1957. From 1973-1974, the College only trained engineers in civil engineering and geology. The training programs lasted for 3 years excluding the first year at College of Sciences. The curriculum focused on general knowledge in those relevant fields. From 1973-1974, College of Electrical Engineering only trained specialists and engineers, the training of technical staff was assigned to Specialized University Center. The College was added to National Technical Center to train technical staff in chemistry in 1962. Up to 1968, the College started to train engineers in chemical engineering. From 1973-1974, the College stopped training technical staff and only remained producing engineers. 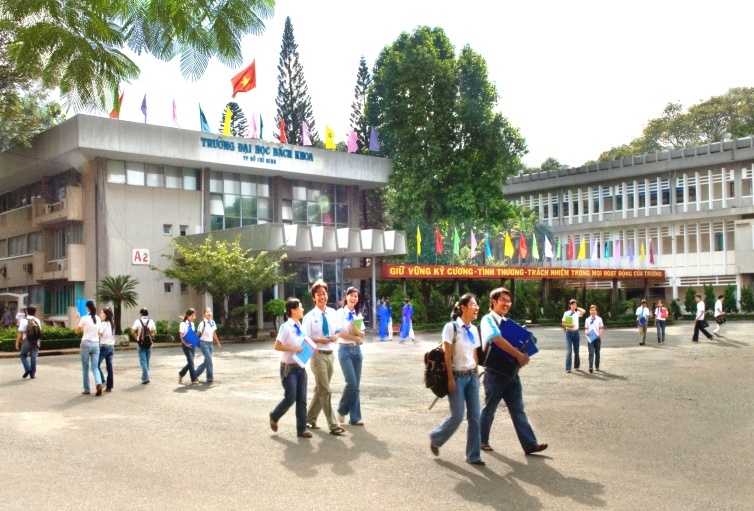 College of Vietnam Maritime Engineering was established in 1951 and offered eight – month training courses for sailors. In 1957, the College was added to National Technical Center. The College then had two divisions: Division of Captain Training and Division of Mechanical Engineering. The College took priority over practice and maritime experience. After completing two-year training, students were encouraged to do apprenticeship on commercial ships, then came back to attend specialized courses at college and got ready for graduation exams 3 months later. In 1960, the College offered two-year training courses at technical staff level for sailors, ship operators, and maritime officers. In 1973, The College provided four-year Bachelor training in maritime engineering. In the 14,5 hectare campus of the former Phu Tho, a training center of engineers and technical staff was emerged with the system of two & three -storied buildings equipped for offices, classrooms (lecture halls), library, laboratories and practicing plants. The Center also had a sport zone which was first designed to serve 1,600 students of all training systems and 200 office staff and professors. In order to be admitted to colleges under National Technical Center, candidates were required to hold a high school degree 2 (senior high school), Group B (specialized in Mathematics) and had to take an entrance examination. The training lasted 4 to 5 years (depending on the training fields) at the level of Bachelor in Engineering and 2 years for the level of technical staff.